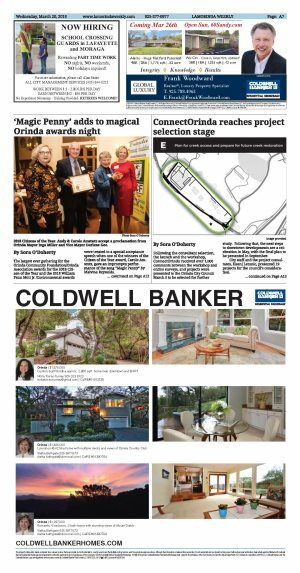 ConnectOrinda received over 1,000 comments between the workshop and online surveys, and projects were presented to the Orinda City Council March 5 to be selected for further study. Following that, the next steps to downtown developments are a celebration in May, with the final plan to be presented in September. City staff and the project consultants, Eisen|Letunic, presented 19 projects for the council's consideration. The six projects that received the most favorable comments were creating a plan for creek access (143 positive comments, 10 negative), creating a pedestrian-friendly alley at Vashell Way near Moraga Way (98, 9) moving the eastbound access ramp to Highway 24 (91, 28), enhancing the walking route between BART and the Village (87, 1) and enhancing the walking route between BART and the Theatre District (81, 5). Creating direct pedestrian linkages between the Village and the Theatre District garnered 84 positive responses, but also 33 negative responses. The only other project to receive the same number of negative responses was calming Moraga Way, which received 62 positive responses. Another project that received many negative responses, was enhancing the north end of Orinda Way for flexible uses and improve walkability from Avenida de Orinda to Camino Pablo (37, 32). The remainder of the projects were, in order of the highest positive responses, creating gateways to Theatre District; inviting people into Theatre District from BART; improving walkability in middle portion of Orinda Way from Santa Maria Way to Avenida de Orinda; enhancing civic-area outdoor spaces for flexible uses; improving roadway bike facilities along Camino Pablo; re-envisioning public spaces in the Theatre District; making south end of Orinda Way pedestrian friendly; providing access to de Laveaga Trail; providing direct street level path to and from the Village and improving the casual carpool waiting area. The projects are broken down both by whether they are short-term, long-term, and by estimated cost. A popular project that could be completed quickly within six months to a year, and at a relatively low cost of approximately $10,000, is the pedestrian-friendly alley at Vashell Way, while moving the eastbound Highway 24 on-ramp to the intersection of Camino Pablo and Brookwood or long-term ways to connect the two sides of downtown Orinda could take from five to 10 years and cost from $5-15 million. 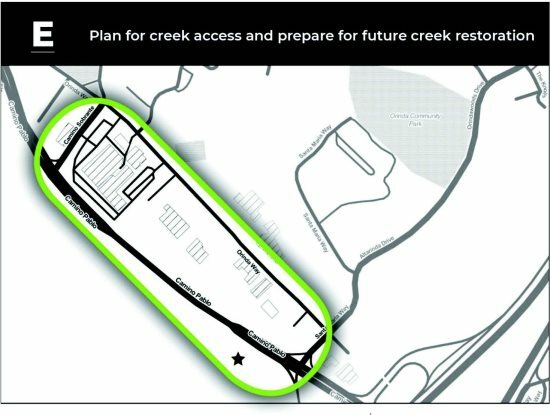 Although it is considered a short-term project, planning and preparing for creek restoration is estimated to take one to three years at a cost of over a half million dollars. Many Orinda residents were present at the meeting to express their opinions. Council Member Dennis Fay estimated that the cost of studies alone on changing the eastbound freeway access could cost half a million dollars or more. However, he thought that an additional on-ramp would be a benefit for fire safety. 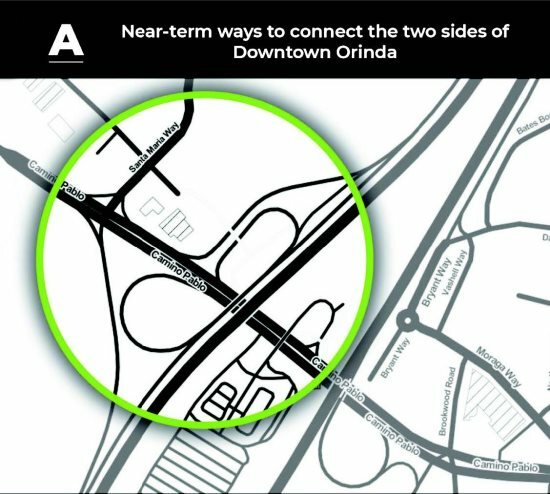 Council Member Amy Worth suggested that the solution would be to open an additional on-ramp, but not to eliminate the current one, which serves a portion of Orinda. Council Member Nick Kosla agreed that it wouldn't be the plan to close the existing on-ramp. Vice Mayor Darlene Gee emphasized that small steps headed in the right direction toward downtown development is the best approach, and once again wondered if it would be cost effective to hire a grant consultant. "I'd love to get started with the low-hanging fruit," she said, suggesting that projects that could be completed quickly are the Vashell Way alley and the use of the library terraces, which was mentioned as a short-term project that could be accomplished within six to 12 months at low cost. The suggestion was that the library terraces had originally been intended for some use, such as small shops, whereas they currently are just part of the landscaping. While Gee believes that the cost of a project to widen the underpass under Highway 24 would be high, she suggested that there might be funds available from Measure RR to open an additional access point to the BART station. Planning Director Drummond Buckley agreed, and said that he had done a three-hour walking tour with BART personnel to point out all the matters relating to the station that could be quickly fixed, such as lighting and access for the disabled. The council also discussed, at the suggestion of City Manager Steve Salomon, the idea of installing a sound wall to protect the Theatre District from the noise of Highway 24. Worth favored plantings in lieu of a wall, while Gee thought that a wall would be not a lot of effort. Fay pointed out that, in his experience, trees do nothing to deflect sound. 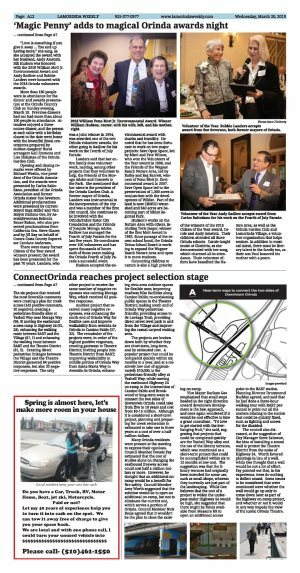 Some issues to be considered that were mentioned were whether the wall would go up only to come down later as part of the highway on-ramp project, and whether or not it would in any way impede the view of the iconic Orinda Theatre.